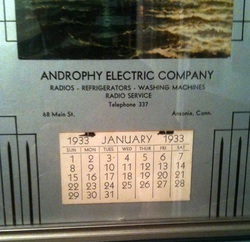 My grandfather's business, Androphy Electric Company, was located in Connecticut's Naugatuck Valley from the early 1920s to the mid 1960s. His brother, my Uncle Jules (Julius) Androphy, also worked at the store. Most of the documents that I have seen cite "The Androphy Brothers" as owners of the business. This is a picture of Androphy Electric Co's storefront. along with its truck taken sometime in the 1920s. 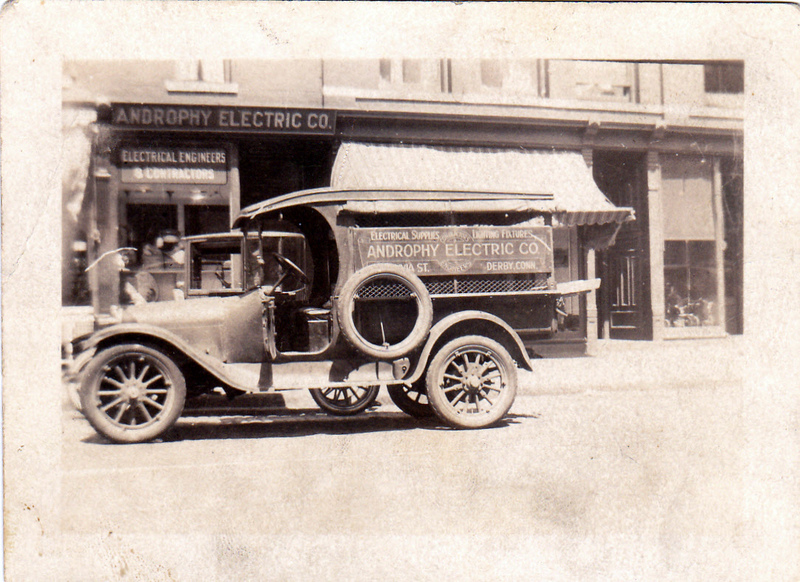 The truck says "Androphy Electric Co." and the top of the sign says "Electrical Supplies" and "Lighting Fixtures." The sign on the store says "Electrical Engineers" and "Contractors" You can click to enlarge it. The first Androphy Electric Company store in Derby, Connecticut was in business in 1922 and it was located on 244 Main Street. Here is the Document E with the reference to that store. The store was relocated in 1922 to 8 Olivia Street in Derby, Connecticut. You can just see the "IA" in "OlLIVIA ST" on the truck sign near the tire. Document F that references the relocation is here. 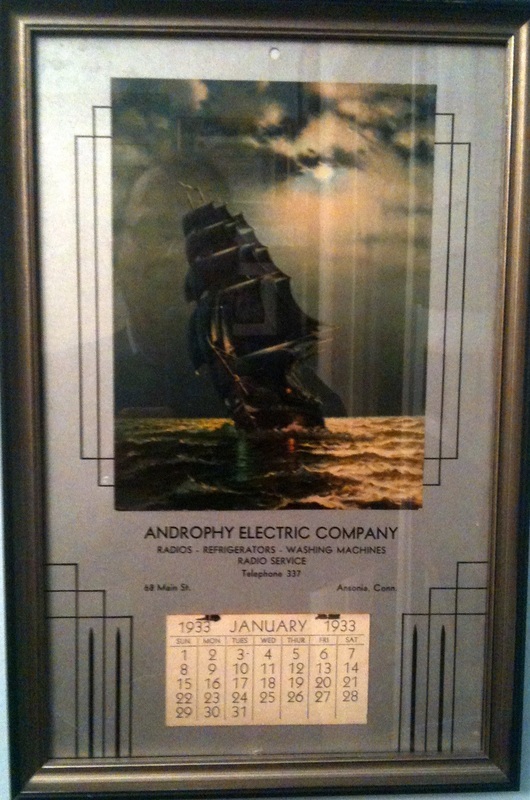 My grandfather most likely worked as an electrician during those years. The term "electrician" was more broadly defined in the 1920s than it is today. In those days, it meant a person who was familiar with all types of electrical devices and services and not just a person who specialized in electrical wiring. In December of 1923, there was a fire at the Derby store that destroyed all of the merchandise. Abe and his brother Jules, moved Androphy Electric Company. to 158 Main Street in Ansonia Connecticut. I learned this information from pictures that I had seen and an article in the December 1923 edition of Electrical Merchandising . Here is a picture of my grandfather in his store in Ansonia, Connecticut in 1939. You can click to enlarge it. The first reference that I can find to the store is from the City of Ansonia Annual Report from 1922. Evidently the city purchased $4.20 worth of supplies from Androphy Electric Co. in 1922 and it is listed in the report. This was quite a fancy store for 1939. The store sold radios and other electrical appliances. There were no televisions sold at retail in 1939. Some of the radio brands shown in the photo are Philco, Atwater Kent and RCA Victor. These were the the best brands in their day. In the 1920s and 1930s, radios were considered pieces of furniture and were mounted in elaborate wooden consoles. 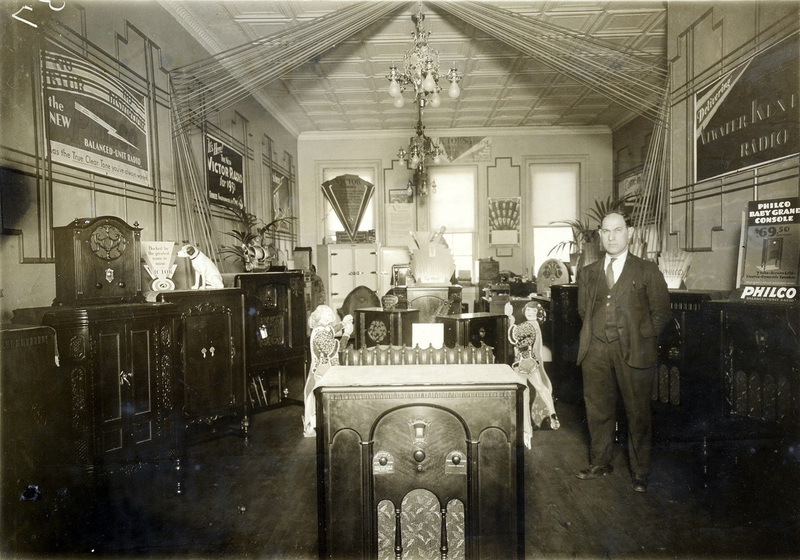 The Philco "Baby Grand Console" on the right side of the photo sold for $69.50. I still have one of my grandfather's 1939 Philco radios at my house. I had the electronics restored in the 1980s and it still works fine. When I worked in the Lower Naugatuck Valley in the 1970s and 1980s, people told me that they knew my grandfather when he helped to convince people in Shelton, Connecticut to take electrical service. Evidently, the Valley was not completely wired for power until the early 1930s and petitions were required to provide service to the more rural areas. Ironically, this activity parallels what I did working for the cable company. While Grandpa convinced people to take electrical service in the 1920s and 30s, I convinced them to sign up for cable television service in the 70s and 80s. There is also a story, confirmed by other family members, that my grandfather found one of the original deeds for the town of either Derby or Shelton, signed by the King of England, in the wall of a house that he was wiring. He told me that he donated it to a local museum but I was never able to track it down. 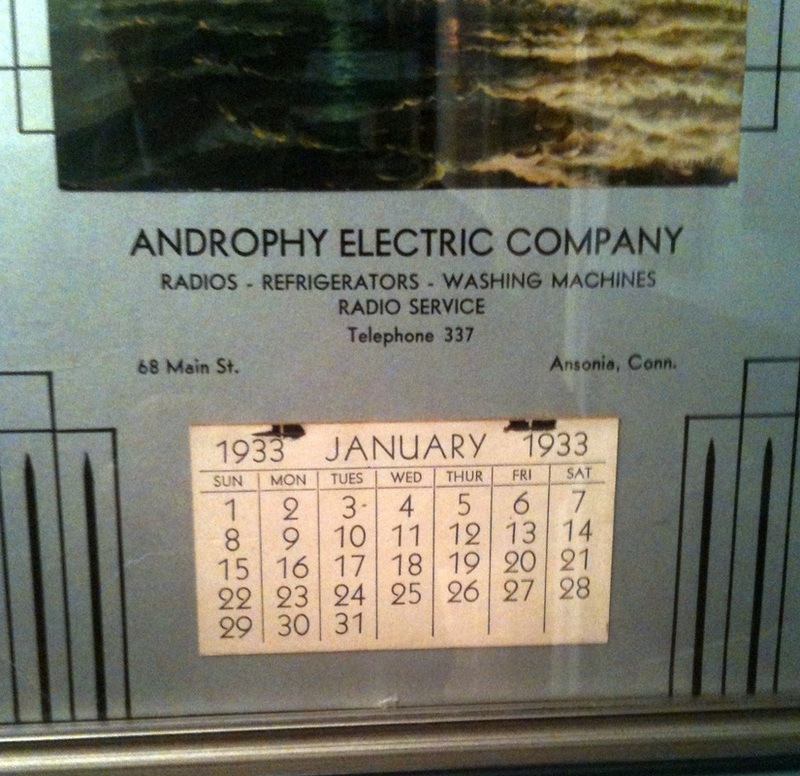 The calendar for Androphy Electric Company in 1933 is pictured on the right. I took this picture at my cousin Joel Androphy's house in Houston. It hangs in the wall of his study. According to the language on the calendar, the store sold ranges, refrigerators, washing machines and radios. I vaguely remember the first Ansonia store on 68 Main Street. This store still exists today as a Pizza restaurant. It had a stairway in the center that led downstairs. It is still configured this way. There was also an upstairs balcony level. My mother told me that the balcony level was the music department that sold records. She told me that she ran the music business when she was still lived at home. I remember the second Ansonia store very well. It was located at 410 Main Street. The neighborhood where the store was located was torn down in the 1960s to make way for the Ansonia Mall that was later torn down in the late 80s or early 90s. I spent a lot of time at the 410 Main Street store when I was young. The store was only one level with the showroom in the front and the work bench in the back where items were repaired. When I visited my grandparents, I went with my grandfather on television service calls and also on appliance deliveries. He had a small warehouse around the corner and a second warehouse on the floor above the garage at their Spring Street home in Derby. My grandmother, Rose, ran the business end of the store. She kept the books, arranged the service schedules and also served as the store greeter. If I remember, she also did the advertising. My grandfather's brother, Jules Androphy, was a partner in the earlier stores but I never saw him at the 410 Main Street store. I believe that he was too ill to work. I remember that Uncle Jules hands shook whenever I saw him. I later learned that he had Parkinson's disease. I paid for much of my college education fixing television sets for TV Engineers, Inc. in Waterbury, CT and working for the University of Connecticut Radio-TV Center in Storrs, CT. I still renew my Connecticut TV Repair license to this day. Hanging around the TV store when I was a kid paid off later in life for me! 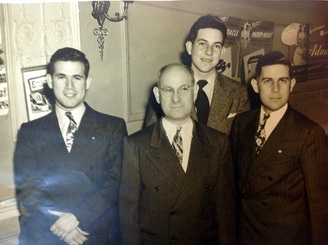 Here is a picture of Abe Androphy with his sons Leonard and Howard. Nephew Sidney (Sonny) Androphy, son of Jules and Rose Androphy is in the back row. Abe Androphy's daughter, my mother, Pearl Androphy Kramer, is not in the picture. 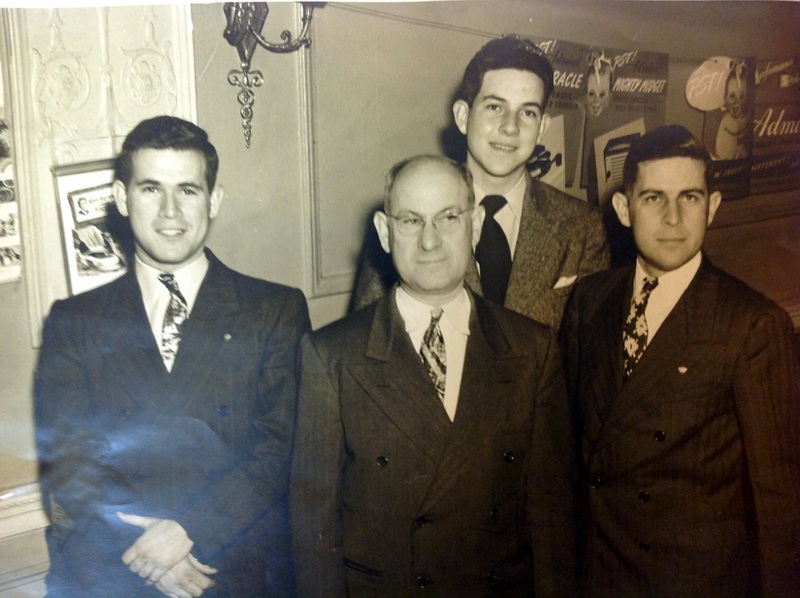 I would guess that this picture was taken in the late 1930s or early 1940s and, judging by the background, it was taken in the Androphy Electric Company store. 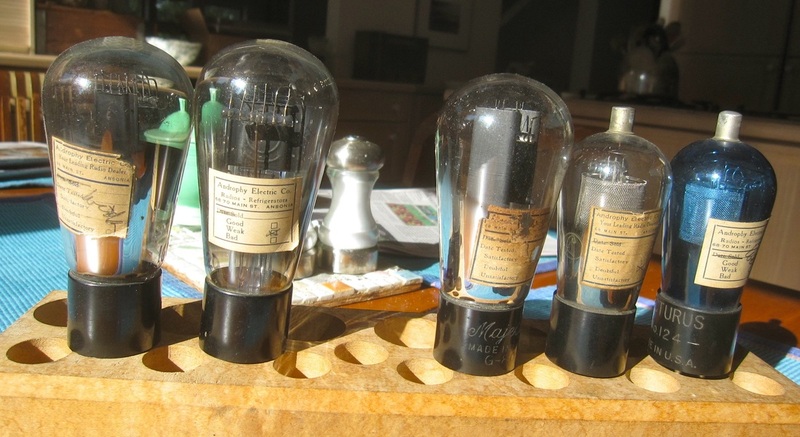 These are vacuum tubes from the 1930s from my grandfather's store. They were taken from old, broken, or discarded radios and then re-tested and sold as used tubes during the Depression. Click the image to enlarge it.